It’s time to plant your fall vegetable garden! 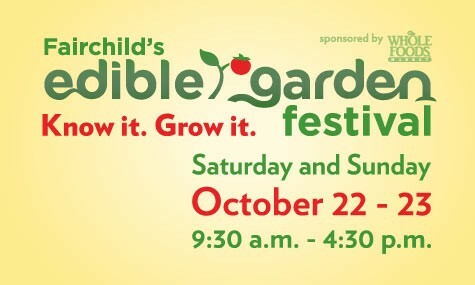 Fairchild Tropical Botanic Garden is once again holding its annual Edible Garden Festival this weekend, October 22 and 23, from 9:30 am to 4:30 pm. The gardening celebration will have ongoing lectures, cooking and gardening demonstrations, free yoga class in the mornings, a beer garden (it is October after all), a plant sale and a farmer’s market. Baby tomato seedlings. Picture taken about 4 weeks ago. Plants for sale are much larger! Bee Heaven Farm will be there with hundreds of heirloom tomato seedlings and dozens of varieties to choose from — small cherry and pear tomatoes, plum and paste varieties, and large beefsteaks. Heirloom tomatoes come in a rainbow of colors — yellow, orange, red, purplish black (those have the best flavor! ), brownish red, pale pink, and even thaose that stay green when ripe. Heirloom tomatoes have some of the most creative names — Green Gage, Brown Berry, Sun Gold, Lollipop, Tommy Toe, Matt’s Wild Cherry (an Everglades tomato), Podland Pink, Brandywine, Black Krim, Georgia Streak, Tigerella, Homestead 24, Taxi, Black Plum, Cream Sausage, Speckled Roman, Red Zebra, Green Zebra — and that’s just a few of the kinds that Bee Heaven Farm will have at the Festival. 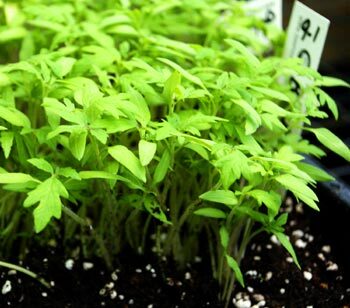 It’s easy to fill your garden with tomato plants. Buy 5 and get one free. Buy 15 and get 5 free. Admission is free for Fairchild members and children 5 and under. Non-members pay $25 for adults, $18 for seniors 65 and up and $12 for children 6-17. Free admission for active military personnel, and you get a $5 eco-discount if you walk or bike to the gardens. Click here for a $2 off coupon.